New Jersey small businesses have received good news in the first days of 2017, with the passing of Senate Bill 123. The bill’s provisions are intended to assist small businesses in the state in obtaining New Jersey surety bonds on public projects. 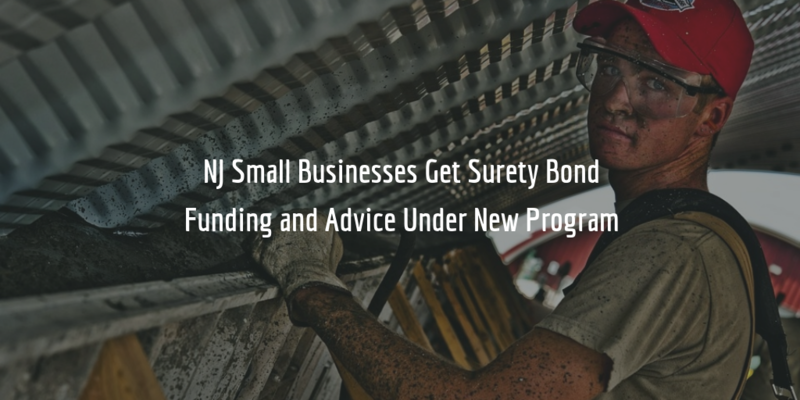 The bill also promises the creation of a whole program at the New Jersey Economic Development Authority (EDA) that will support and educate businesses about surety bonds and how to meet bonding requirements. Read about the bill and its provisions below! Senate Bill 123 introduces the creation of the Small Business Bonding Readiness Assistance Program at the New Jersey EDA. This program is intended to help small businesses with obtaining their New Jersey surety bonds through education, workshops, and funding. Since the bond cost on construction projects is often too high for small businesses, they are unable to participate in bids and win contracts against bigger businesses. The workshops and consulting sessions in the assistance program will focus on the improvement of the financial presentation of small businesses, the increase of their bonding capacity, and the betterment of their operational efficiency. The Small Business Bonding Readiness Assistance Fund which will be created within the program will provide funding to eligible businesses to participate in the program. Ultimately, the goal of the program is to support small businesses in achieving an equal footing by providing them with the know-how and material resources to win projects. If successful, this program should allow such businesses to bid on public projects which may otherwise require surety bonds that are beyond their financial capacity. As part of the program, the Enterprise Zone Assistance Fund will also be created. This fund will support and pay for public improvement projects, economic development projects and public services on an annual basis, further supporting the small business community and making business available. Typically contract bonds are always required by licensed and bonded contractors who want to work on a public or federal projects. To do so, they must first submit a bid bond, and if their bid is approved and they win the contract, they are also required to obtain a performance and payment bond. These bonds guarantee that the contractor will perform work in accordance with the surety bond agreement and the contract they have won. They also guarantee the contractor will pay to all their subcontractors, material suppliers, and laborers. Obtaining these bonds usually has a very high cost as claims on construction projects can be very high, and so the cost of these bonds is also higher than for licensing bonds, for example. That’s why the New Jersey Small Business Bonding Readiness Assistance Program is really good news to small businesses who are capable of competing with bigger contractors in terms of quality of their work but are denied contracts on the grounds of lacking financial capacity. Do you look forward to participating in this program? Let us know what you think about it!